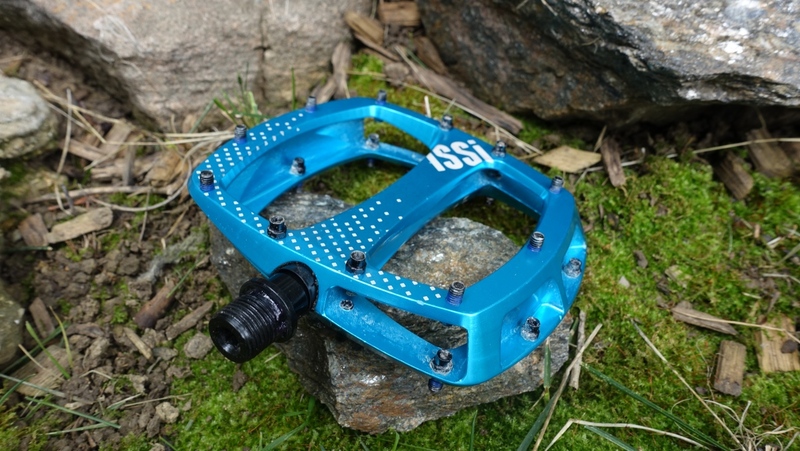 The iSSi STOMP flat pedals looks great and provides great traction and pedaling efficiency. The iSSi STOMP flat pedals provide a large platform and excellent traction for secure descending and efficient pedaling. 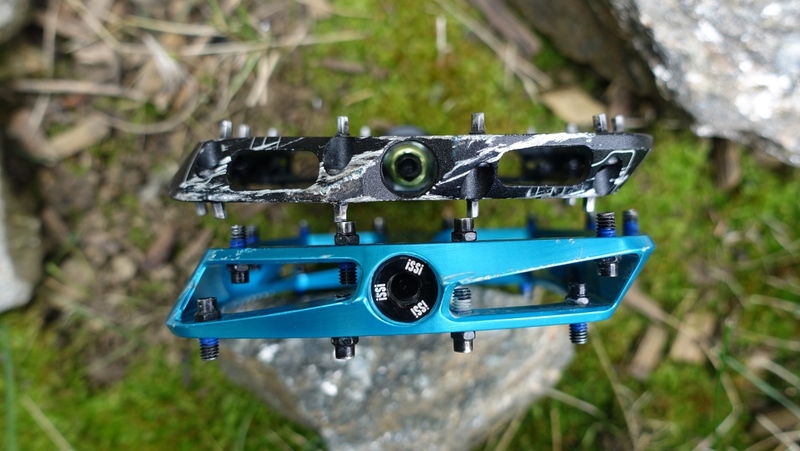 With a full-length axle, two bearings, and a bushing the iSSi STOMP are made for the long haul, though the wide stance can snag on rocks in tight spots, meaning they are not be the best pedal for slower, technical riding. The iSSi STOMP isn’t as thin at Race Face’s Atlas pedal but it does feature reversible pins for adjustable traction. Flat pedal options abound and there are loads of great models out there. Among them is the new iSSi STOMP. With a full-length chromoly axle, two sealed bearings, and a bushing, the iSSi STOMPs are built with durability in mind. The anodized finish on the aluminum pedal body pops nicely and laser-etched graphics lend a bit of flair. Offered in black, plum, lime, and blue anodized, the iSSi STOMP has a fairly traditional pedal shape. The pins on the iSSi STOMPs are reversible, with 5.5mm or 4.5mm lengths depending on orientation. There are 11 per side. I ran the pins in the stock set-up with longer option at the front and back of the pedal, and lower pins in the center. This offered a more concave shape to the pedal. It worked nicely for me during mixed riding that included long climbs and technical descents. This arrangement also meant that adjusting my foot on the pedal was easy while pedaling. For those seeking maximum shoe retention, flipping the center four pins is a good option. Two sealed bearings, a bushing, and a full-length chrome-moly spindle should make a durable pedal. If you’re concerned with biomechanics, the iSSi STOMP’s pedal body is 18mm thick at the axle. But because of the full-length axle they can’t get as thin as flat pedal models with a partial axle. For comparison, Race Face’s Atlas pedals are 13mm at the axle. This isn’t a huge concern for me, but I will adjust my seat height as pedal dimensions change. The dimension that troubled me a bit more was the width of the iSSi STOMPs. The pedal bodies measure a fairly large 107mm wide and 120mm long. This, combined with 11 pins per side and a gentle 2mm of body concavity provides loads of shoe traction. Pedaling also feels exceptionally efficient with your shoe so well supported. But from where the pedal meets the crank to the outside of the pedal body is 119mm. The pedal body also have a very square shape so it has corners at the front and rear that can catch on rocks and roots more easily than tapered designs. In wide-open terrain this isn’t a concern. But in tighter confines and squeezing through rocky pinch points, it certainly kept me alert. The width of the iSSi STOMPs measures similarly to Shimano’s old Saint pedal. Race Face’s Atlas is slimmer though at 114mm. Its narrower width, combined with its thinner pedal body, makes for a lower number of pedal strikes (at least for me it does). The added width and squared shape of the iSSi STOMP makes for frequent pedal strikes. 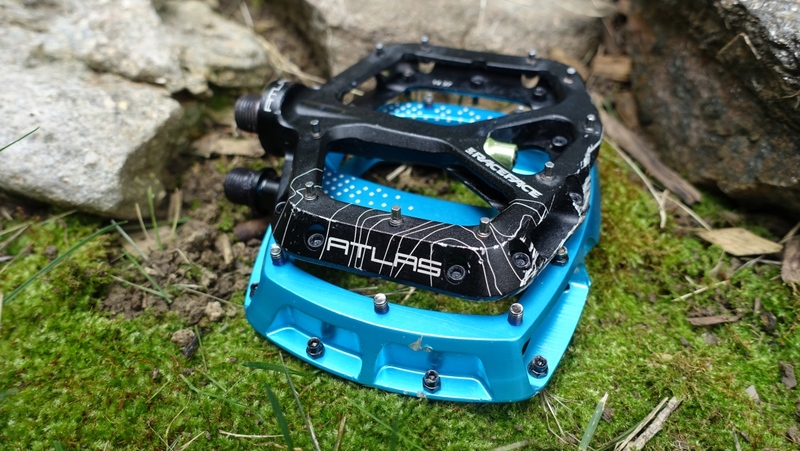 Though, as seen on the Atlas pedals pictured, pedal strikes are simply a part of mountain biking. Where the iSSi STOMPs earn a few points back though is in price. Retailing for $115, they are $65 less than the Race Face model used here for comparison. With their durable construction, I think this pricing is fair, though I wouldn’t call them a bargain. In the weight department, the iSSi STOMPs, at 470 grams a pair, aren’t impressively light nor are they crank anchors. The full axle construction and large platform are going to add weight. But if you’re looking for maximum foot support, weight probably doesn’t rank at the top of your decision-making list. Again, as with pricing, they fall right in the middle of most of their competition. 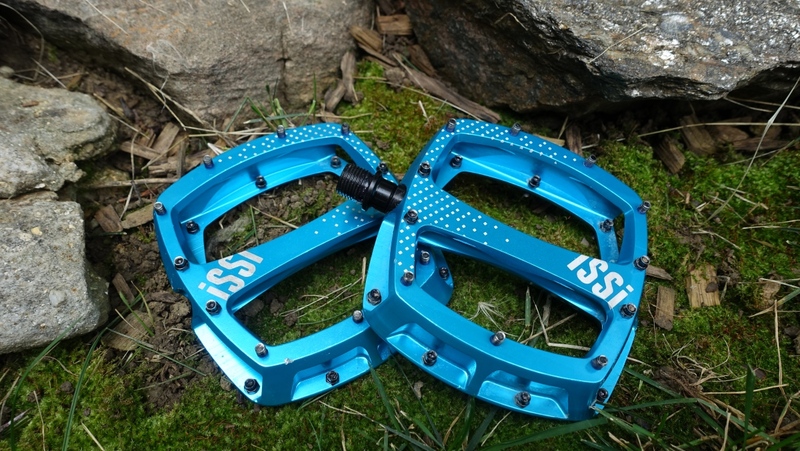 If you ride in wide-open conditions, use a lift to bypass slow, technical climbs, or have the skills to simply jump pinch points, then the iSSi STOMPs are a great, durable option. While they aren’t the least expensive on the market, they are made to last. If you ride flats and enjoy low-speed, technical trails, you’ll want to look elsewhere for a thinner, narrower pedal. Nick Legan is happiest with some grease under his nails and a long dirt climb ahead. As a former WorldTour team mechanic, Legan plied his trade at all the Grand Tours, Spring Classics, World Championships and even the 2008 Beijing Olympics. In recent years, gravel and ultra-distance racing has a firm grip on Legan’s attention, but his love of mountain biking and long road rides hasn’t diminished. Originally a Hoosier, Legan settled in Boulder, Colorado, 14 years ago after finishing his time at Indiana University studying French and journalism. He served as the technical editor at VeloNews for two years and now contributes to Adventure Cyclist, Mtbr and RoadBikeReview. To follow along on Legan’s cycling adventures, find him on Instagram at @nlegan and be sure to check out his new book Gravel Cycling: The Complete Guide to Gravel Racing and Adventure Bikepacking. What's the fastest pedal for enduro: flats or clips?